We are absolutely in love with this city. 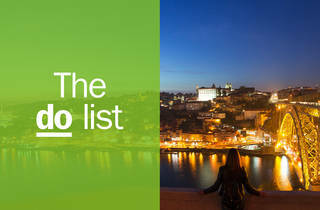 For its narrow streets and colorful houses, breathtaking views from both the city and the Douro river, its galleries full of ancient and contemporary art, its gardens and museums, and its restaurants with both traditional food (don't miss the francesinhas and the cachorrinhos) and inspirations from around the world. Invicta is a box full of surprises, even if those aren’t always in plain sight. You have search for them. So that nothing slips by you, here is a list of 31 incredible things to do in Porto. Read through it carefully and feel free to share it with any and everyone - caring is sharing, after all. What is it? 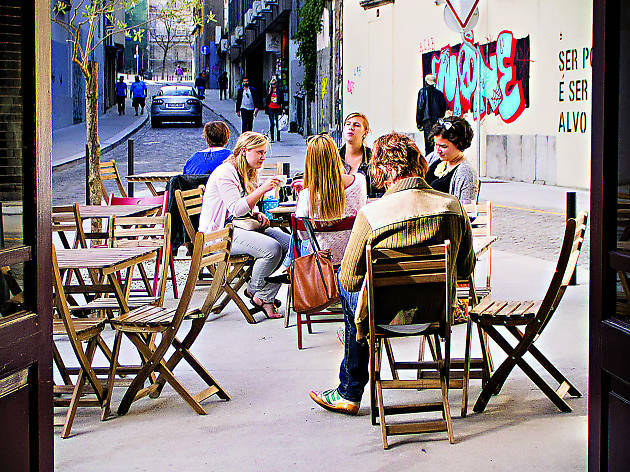 It is one of the busiest places in Porto’s Baixa to start out your day. Why? 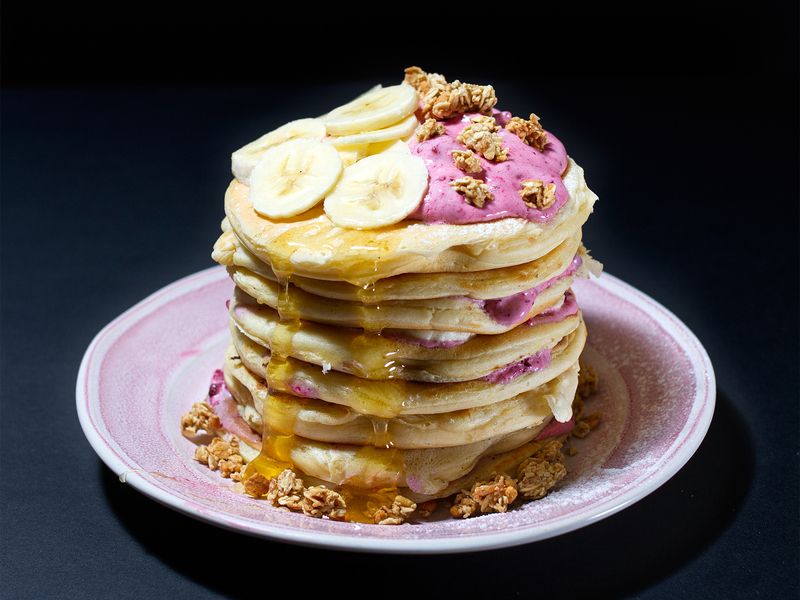 They make the best pancakes in town. Why go? 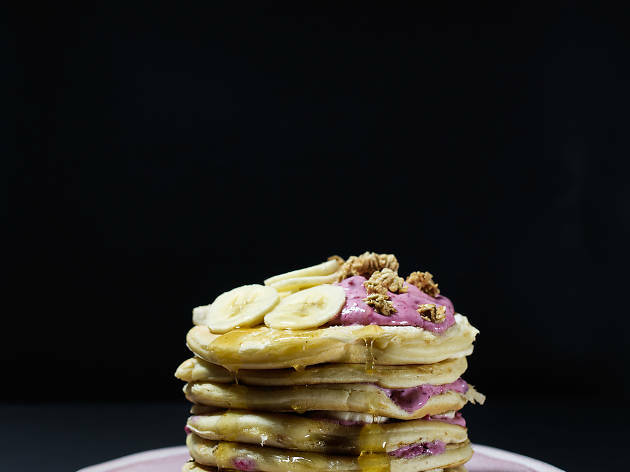 Besides being tall, fluffy and very tasty, the client can choose the batter of his choice. There are six options. It can be simple, chocolate, oatmeal, vegan, blueberry or Oreo cookie batter. As for the toppings, there is a bit of everything. From fresh fruit, granola, ice cream balls and Nutella or peanut butter creams. 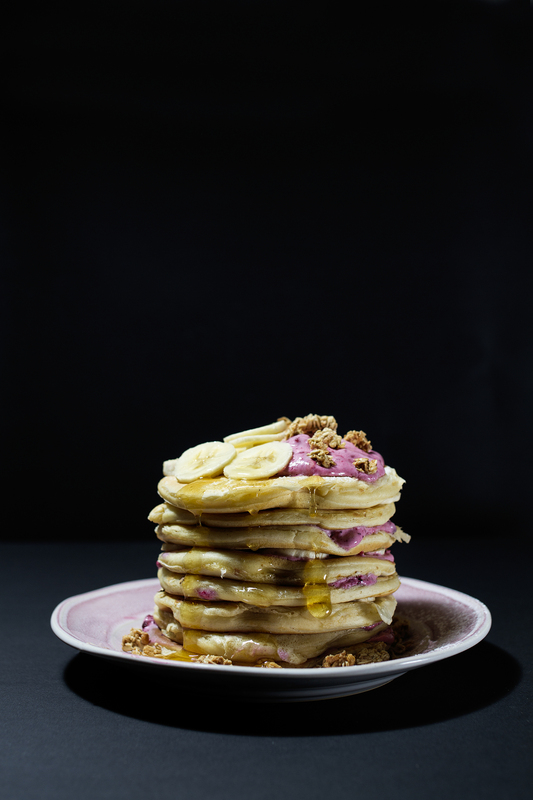 Don’t miss: The salty pancake with cheese, bacon and garlic and herbs butter (€3), or the pancake of the season, with ingredients that vary (€3.50). What is it? It is one of the biggest (if not the biggest) ex-libris of the city. And the tour through Invicta (another name for Porto) is not complete without a visit to this monument. It's like heading out to Rome and not visiting the Pope. Why go? The project for a bell tower was presented by the architect Nicolau Nasoni in 1753. Construction started the following year and took nine to finish. The inauguration happened in 1763, after the iron cross was placed at the top and the image of Saint Paul in the niche above the door. In Baroque style, this tower was built on an uneven street. Congratulations to the artist! Don’t miss: One of the best views of the city is at the top of this tower 75 meters high, but to enjoy it you will have to climb 225 steps. It will be worth it, we promise. What is it? 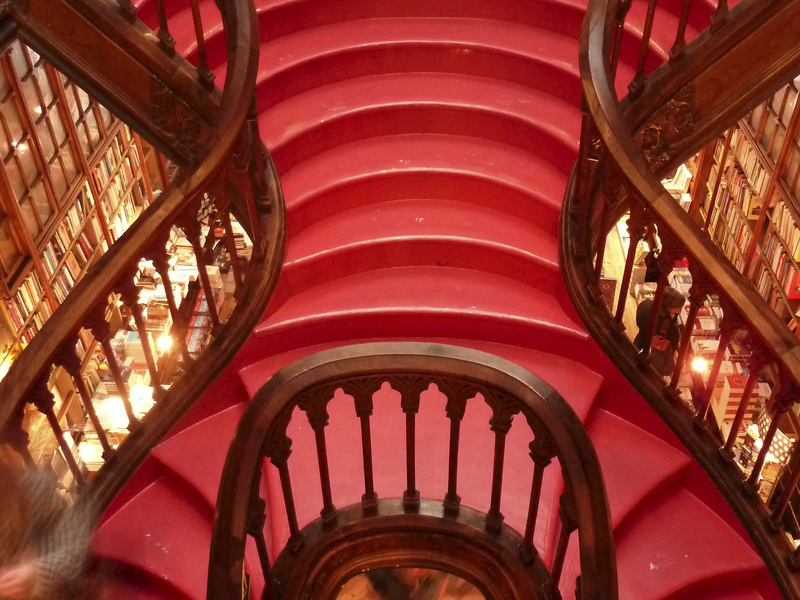 It is one of the most emblematic bookstores in the country — and the world. 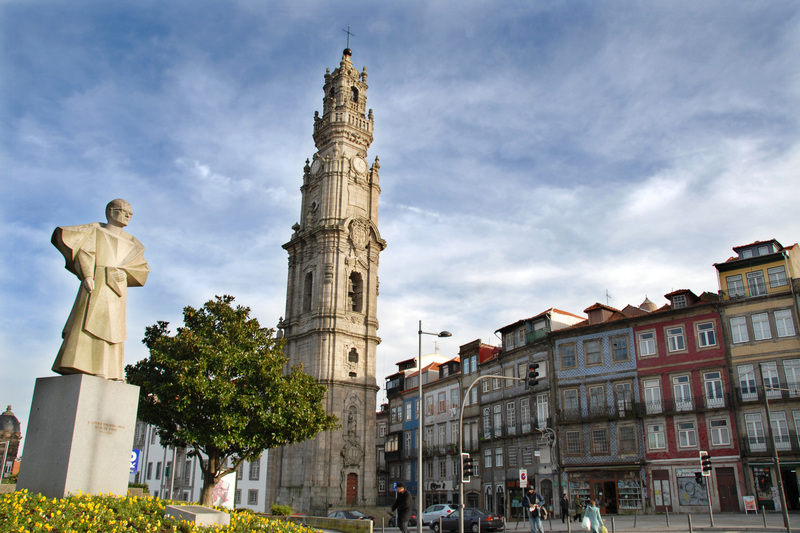 It is right in the center of Porto and is part of its historical heritage. Why go? It was born in 1906 at number 144 Rua das Carmelitas. And it remained there until today, with the neogothic architecture that characterizes it, the carved wood, the golden columns and the ornate ceilings that form a unique calling card. But this historic building is not only there to be admired, about 300 thousand books per year come out of the high shelves distributed on both floors. Don’t miss: If you are a fan of the Harry Potter saga, know that this bookstore served as an inspiring setting for author J.K. Rolling, who lived in Porto. Admission costs €5, but can be discounted of your bill when you buy a book. What is it? As the name implies (it means "The Portuguese Life"), this store, in the heart of Baixa, sells only branded products, some of them centennial, 100% Portuguese. Why go? The number 20 on the Rua das Galerias de Paris is the perfect place for those who do not want to take home magnets as souvenirs. On the two floors of this store, the variety is plenty and goes from toys from the pre-electronic era to stationary. In addition, you will also find fragrances, jewellery, clothing and various delicacies. Don’t miss: There you can buy some Portuguese classics, such as Confiança soaps, Minerva preserves and Couto toothpaste. What is it? 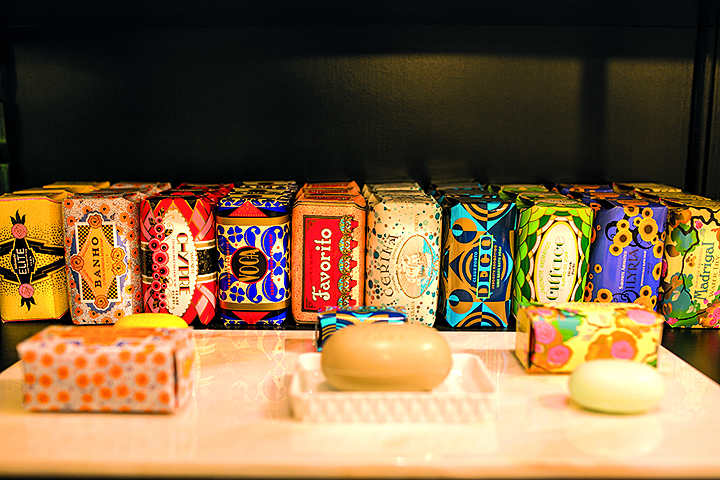 Claus Porto is a brand of soaps and fragrances that survived monarchies, republics, dictatorships and revolutions. It has more than 130 years. Why go? 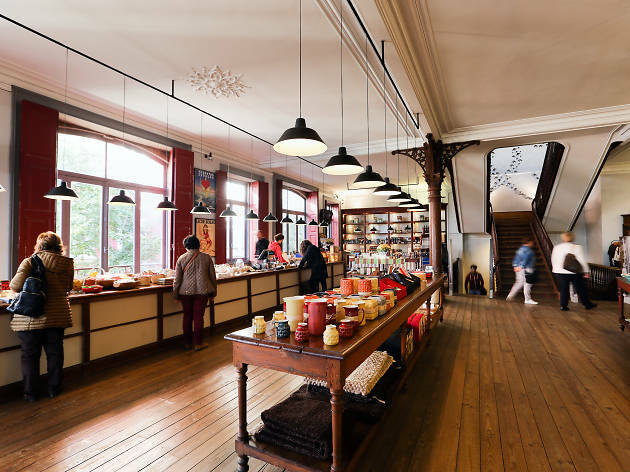 The first thing you see when you enter this space, where the Porto Marionette Museum once operated, is the store. It is there that you will be able to buy all the brands products, from the classic soaps, to the body creams and the colognes. On the second floor there is a gallery where, through hand-drawn drawings, lithographs, photographs and newspaper clippings, the history of the brand is told over four generations. Don’t miss: On the third and last floor are organized, every month, workshops where you can learn how to make the brands products. In addition, on Saturdays, there is a traditional barber shop. What is it? 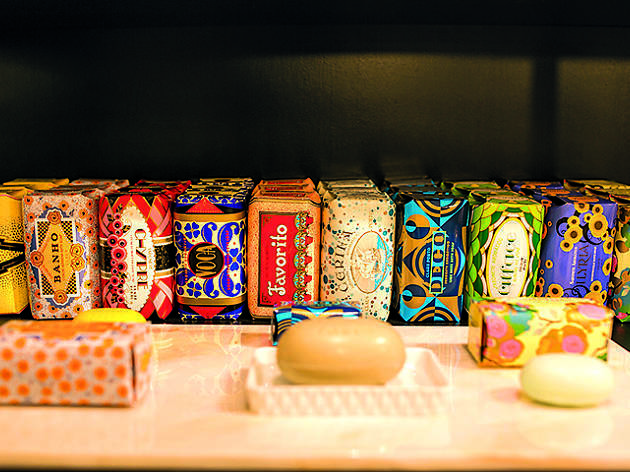 Chocolataria Equador is a brand, 100% Portuguese, made of handmade chocolate. In Invicta there are stores in Rua Sá da Bandeira, Rua das Flores and Rua Sousa Viterbo. Why go? 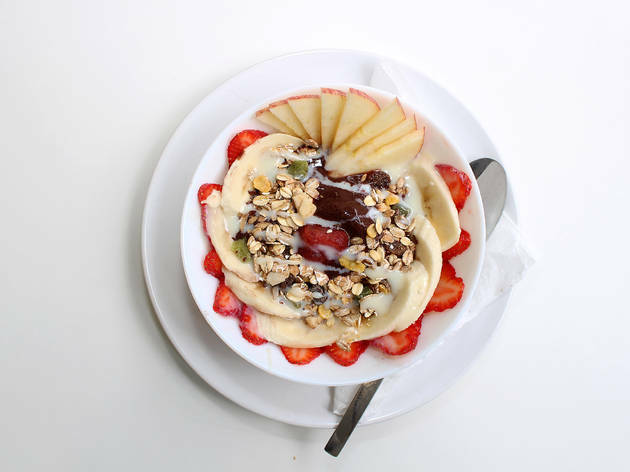 There are a thousand and one reasons to want to visit the shops of Chocolataria Equador, as you might imagine. But the bonbons, the truffles, the roasted cocoa beans, the chocolate bars and the hot chocolate are, of course, the main ones. Look at the beautiful illustrations and design of the packaging, also made there, that cover the sweets. Don’t miss: In this store, in addition to selling chocolate, they also harmonize it with coffee or Port wine. If you want to try it, there are special tasting sessions (€12.50) which include three wines and three chocolates. What is it? 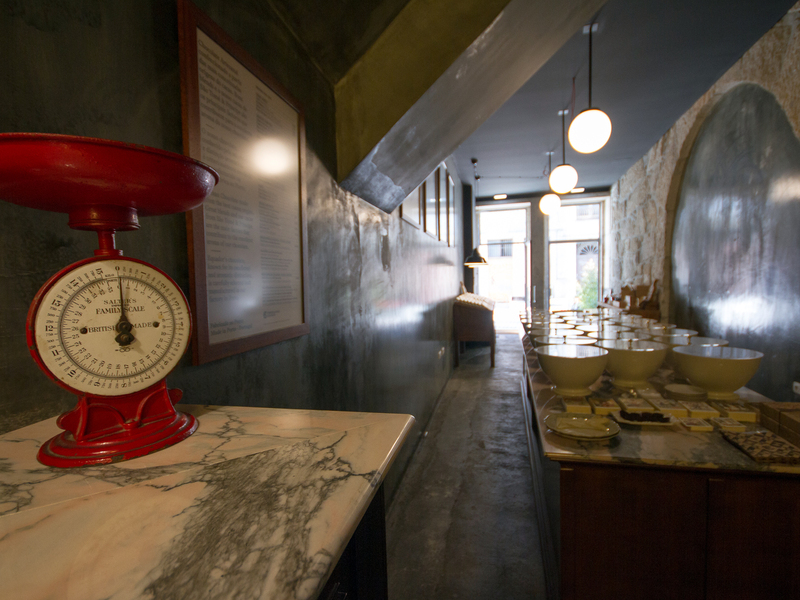 It is one of the best restaurants of traditional Portuguese food in the city, where dishes are made with the expertise and love of the old days. Why go? 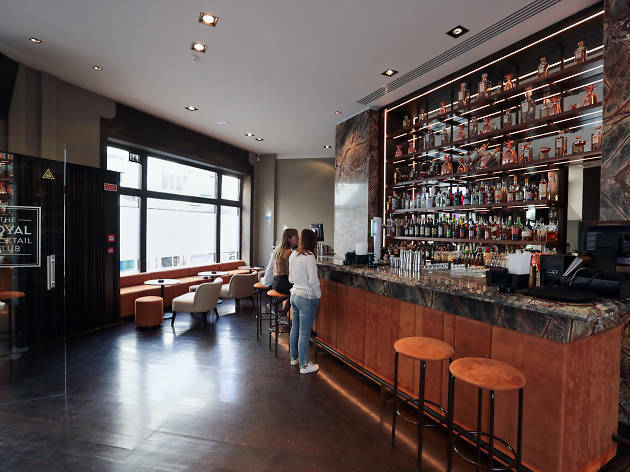 There are many reasons, but the friendly service, in true Porto style, the busy and peculiar esplanade on the São Nicolau stairs and the proximity to the river are some of the characteristics that make this restaurant a true box office success. Don’t miss: The freshly-baked cod dumplings that arrive on the table as soon as you sit (€1), octopus fillets with rice (€15.50), and the famous cow tongue stewed with peas (€12,50). But there are others. The difficult thing is to choose. What is it? 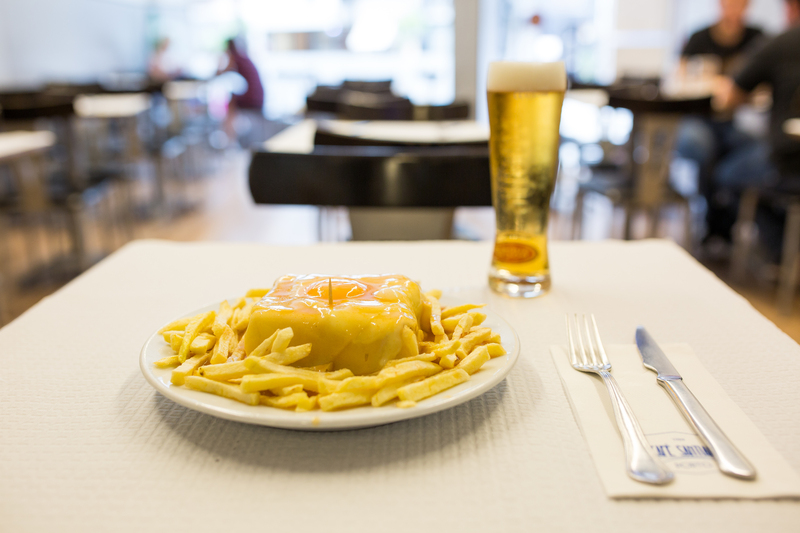 For us, the best place in town to eat francesinha, the beloved Porto-style sandwiches. Why go? 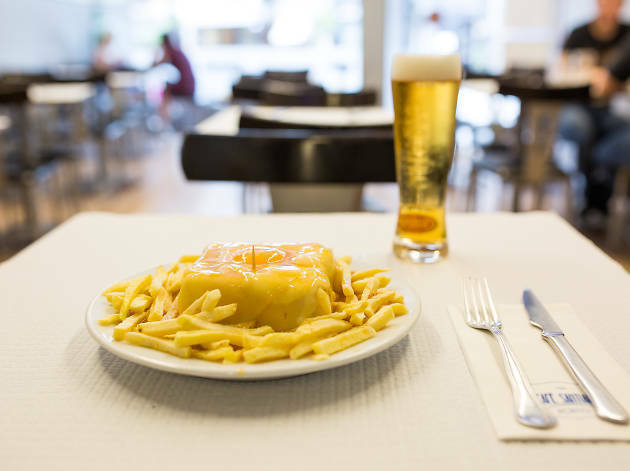 It has become, for several years, the site of choice for Porto and tourists when the goal is to devour a francesinha made with high-quality ingredients. Tip: go early or go patiently to wait in line. Don’t miss: Francesinha Santiago is made with mortadella, fresh sausage, sausage, steak, ham, cheese, egg and hand-cut fries (€9.75). And it is watered down, of course, with the sauce that made it famous. What is it? It is a vegetarian restaurant full of tasty, greasy (yes, it is possible), and creative dishes, which gains supporters every day. Why go? If you think that the vegetarian food is all green and you always tastes the same, Época is the ideal place to become a true adept of vegetarian food. The dishes are made with seasonal products, and the space is decorated in the Nordic style, very clean and full of natural light. Don’t miss: The incredible sauteed brown rice malt with a reduction of soybeans, homemade kimchi, sautéed mushrooms, fried egg, fresh coriander and roasted peanuts (€8), as well as Turkish eggs, fried, served with seasoned greek yogurt (6€). What is it? It is one of the oldest areas of the city and one of the most beautiful as well. The landscape over the river and the rabelo boats (a traditional Portuguese wooden cargo boat used to transport people and goods along the Douro River) that cross the waters make the delights of tourists and locals alike. Why go? Lose yourself in the narrow streets of Porto, full of ups and downs, colorful houses and caricature nooks. Charge your camera’s and phone’s battery because it will be almost impossible not to register everything here. It also has good restaurants, bars and shops worth visiting. Don’t miss: Visit Casa do Infante, to learn more about the historical evolution of this area of ​​Invicta, or take a leap at the beautiful Palácio da Bolsa. What is it? 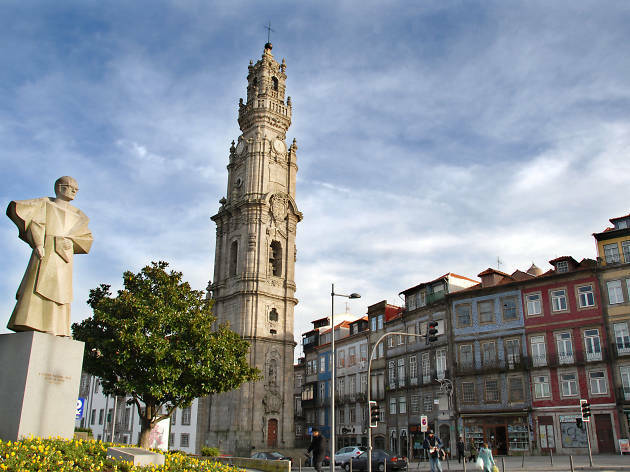 It is close to the upper board of the bridge D. Luís and is a fantastic viewpoint for the historical area of ​​Porto. Not only that, it is also a beautiful green space. Why go? Walking from the center of Porto to this garden is a good way to get to know the city. 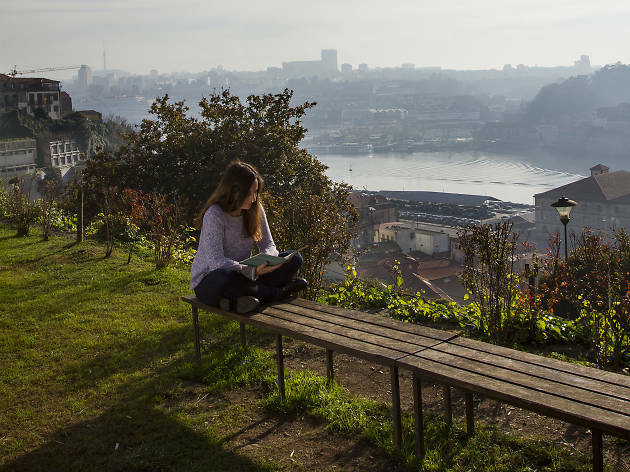 The upper deck of the D. Luís bridge guarantees you a panoramic view but, in the garden, you can concentrate on the Porto landscape that alone is already worth it. The proximity to the Serra do Pilar is also a plus. 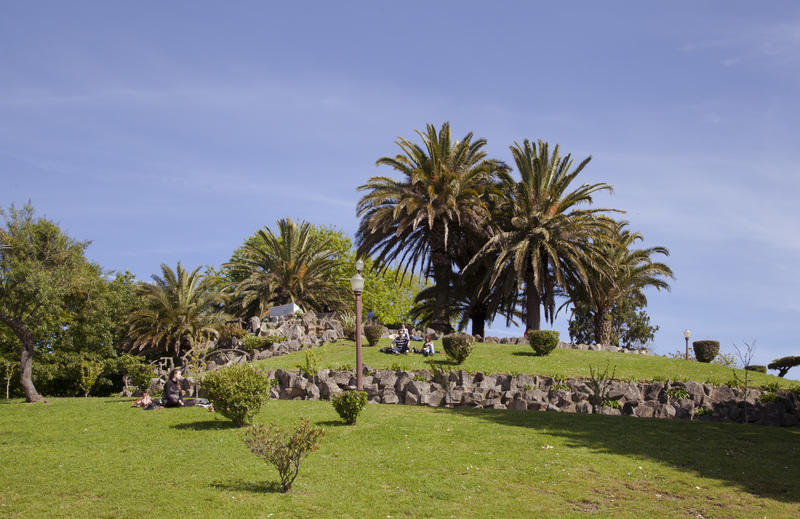 Don’t miss: A sunset lying on the grass, a visit to one of the markets that take place in this space and a cable car ride are always good ideas. What is it? First it was a basement, now it's a basement- museum. 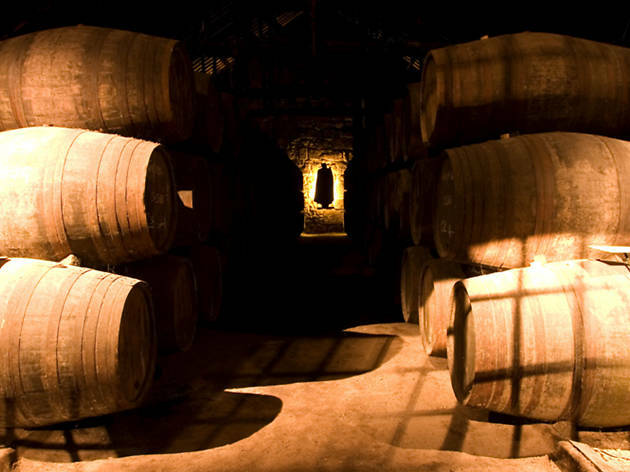 Those responsible for the Sandeman cellars created a museum that contextualizes and tells the history of this brand of Port. Why go? Coming to Porto and not visiting one of the Port Wine cellars is like going to Paris and not seeing the Eiffel Tower. This granite building, built in 1797, houses an impressive collection of paintings, photographs, ceramics and antique bottles, of one of the port's most international brands. Every year they host more than 150 thousand visits. Don’t miss: The explanation of Don, the mythical and mysterious lord in black of the logo created in 1928, dressed in the typical Portuguese students' cape and Spanish sombrero. And, of course, one or two glasses of Port wine (Visits price: between €10 and €40). What is it? It is in the Andresen House, in the Botanical Garden, and is the first Living Science Center dedicated to biodiversity. Why go? 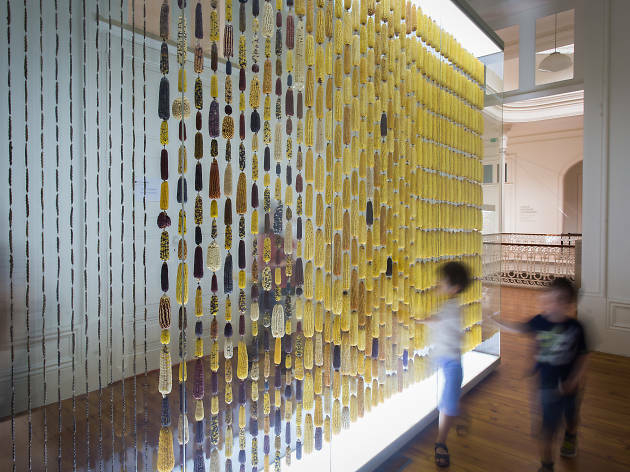 First, for the scientific and artistic journey that this gallery provides, since in this space art crosses with biology and natural history, stimulating a series of sensory experiences. 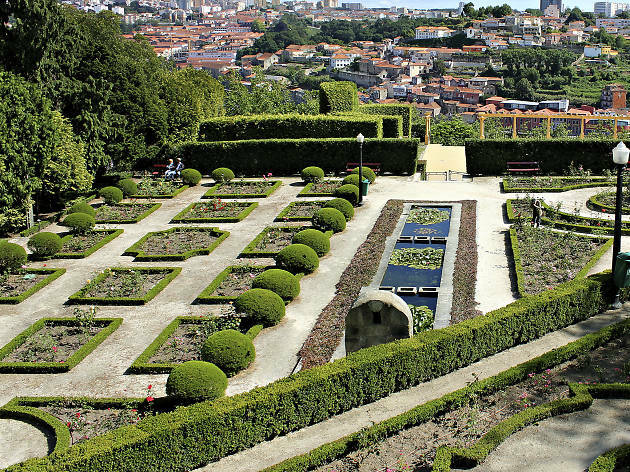 Then get lost in the Botanical Garden that inspired several works by the Portuguese writer Sophia de Mello Breyner Andresen. Don’t miss: The skeleton of a whale found in 1937, the very realistic Charles Darwin wax sculpture and the two selfie spots. What is it? It is one of the most iconic spaces of the Invicta to stroll around. There are eight hectares of garden that welcome the Crystal Palace. Why go? 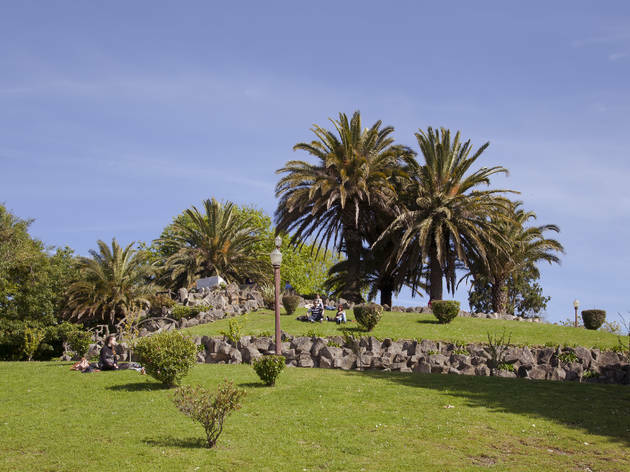 Since the nineteenth century, when they were designed by the German landscape architect Émille David, that people is used to stroll through these gardens. Nowadays, you can also count on peacock families. 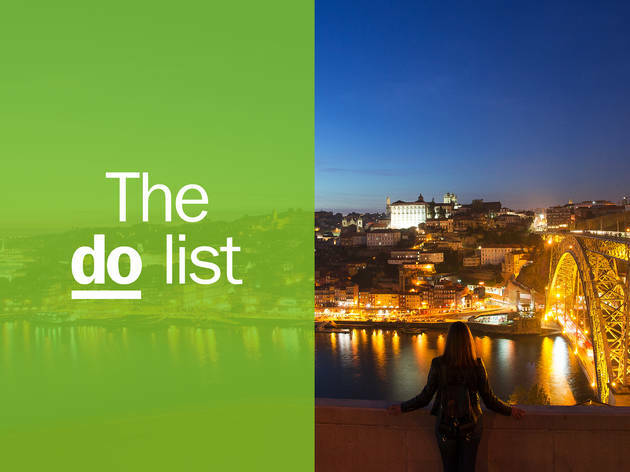 This green destination is a must stop for those addicted to strategic viewpoints with panoramic views of the Douro and the city. 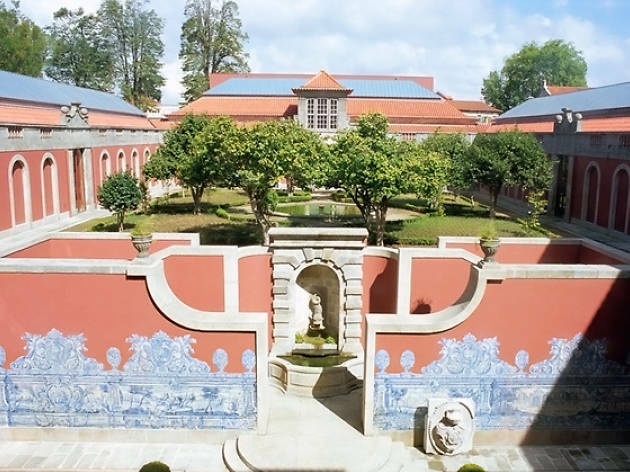 Don’t miss: The panoramic view, the Almeida Garrett Municipal Library, the Romantic Museum of Quinta da Macieirinha and the Palace itself, which always has good exhibitions. What is it? It is one of the most important museums of the country and the first public museum, although with another name and address at the time. Why go? The museum has a vast collection of paintings from the 16th to the 20th centuries, ceramics, sculpture, engraving, jewellery and textiles. 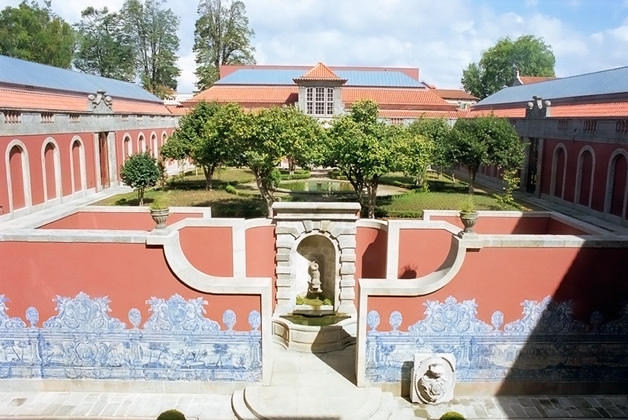 On the walls of this museum you will find paintings by great Portuguese artists such as Henrique Pousão, Silva Porto, António Carneiro, Aurelia de Souza or Amadeo de Souza Cardoso. 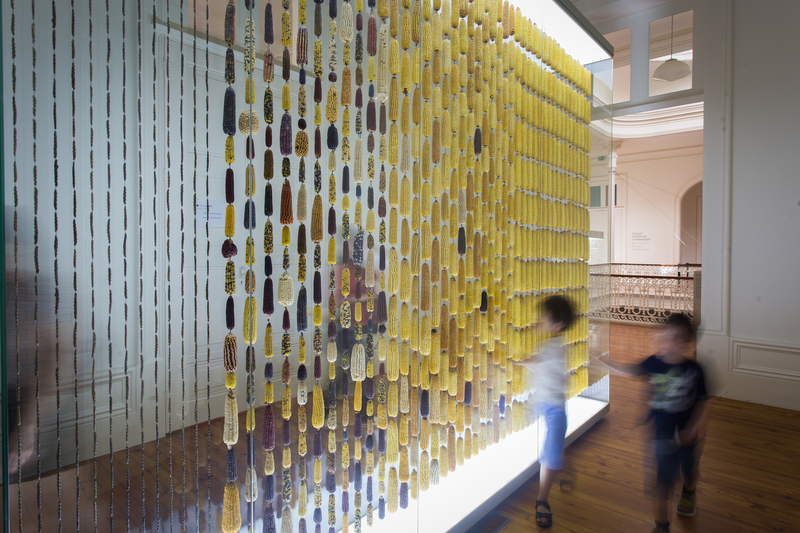 In addition, the institution also receives temporary exhibitions. Don’t miss: When you visit the museum, admire the work "O Desterrado" (1872), by the artist who gave the house its name. This is a mandatory stop. The prices are around €2.50 and €5. What is it? 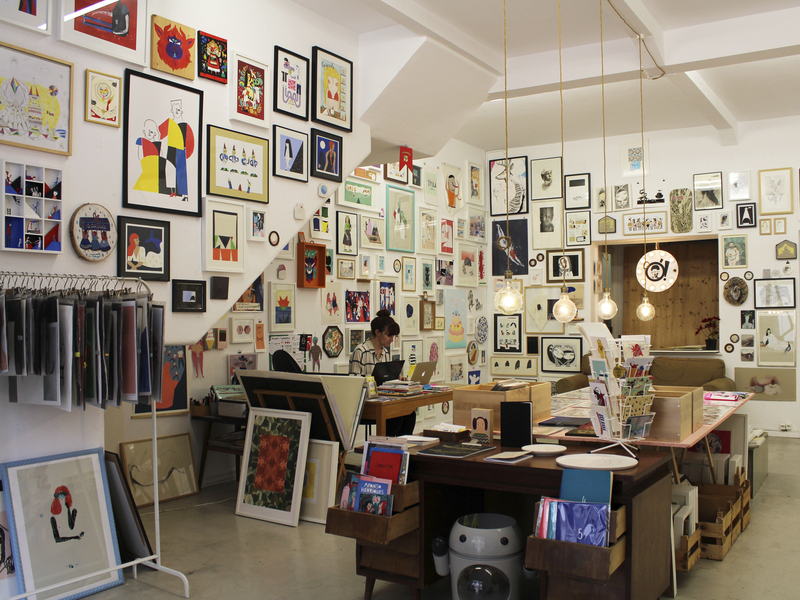 It is a store / gallery, essential in the illustration tour of Porto, which serves as a launching pad and maturation space for young artists, local and international. Why go? In addition to original works, in this space you will find prints, books, t-shirts, tote bags, among many other things that you will want to take home with you. 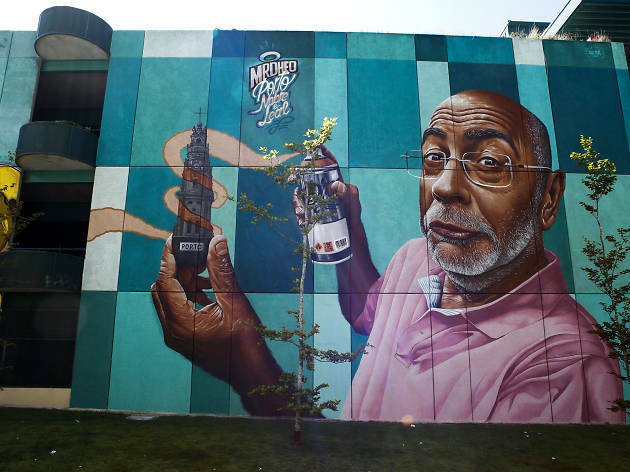 Mariana A Miserável, Ana Seixas, David Penela, Angela Dalinger, Maria Imaginário and Tina Siuda are some of the illustrators who give color to the walls of this space, in the most artistic quarter of the city. Don’t miss: Ó! Galeria is in Miguel Bombarda, the arts quarter. 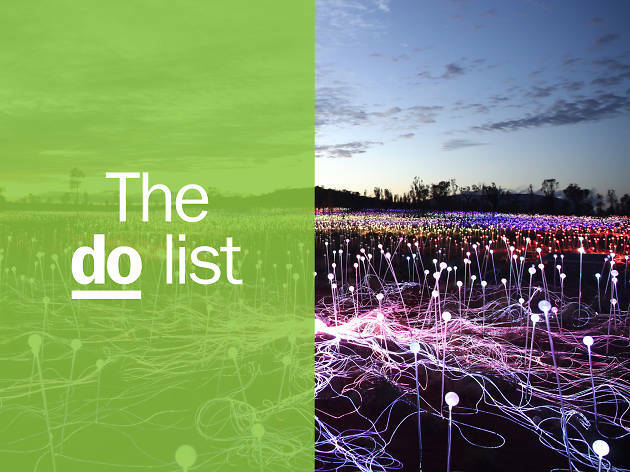 While you are here, get to know the many galleries in the area. What is it? 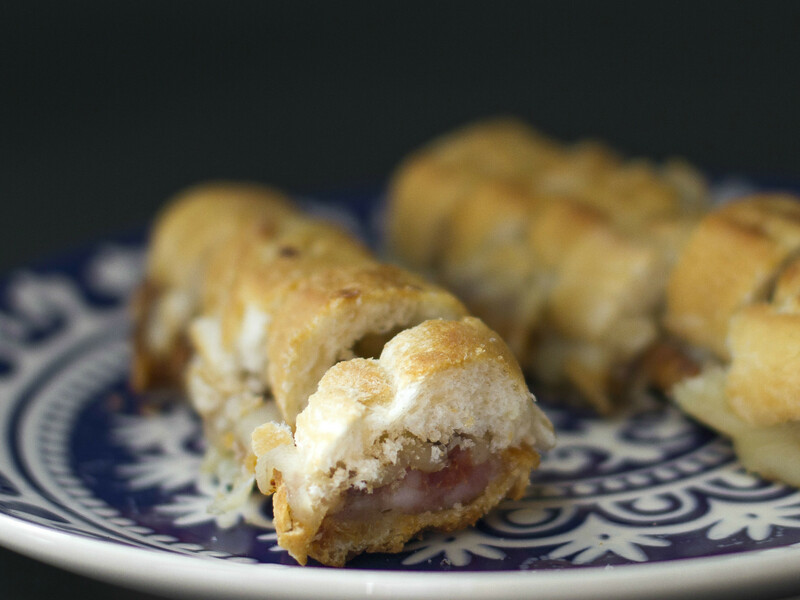 It is one of the best known pastries of Porto, much because of its excellent éclairs. Every day 2,500 are made and the number doubles over the weekend. Why go? 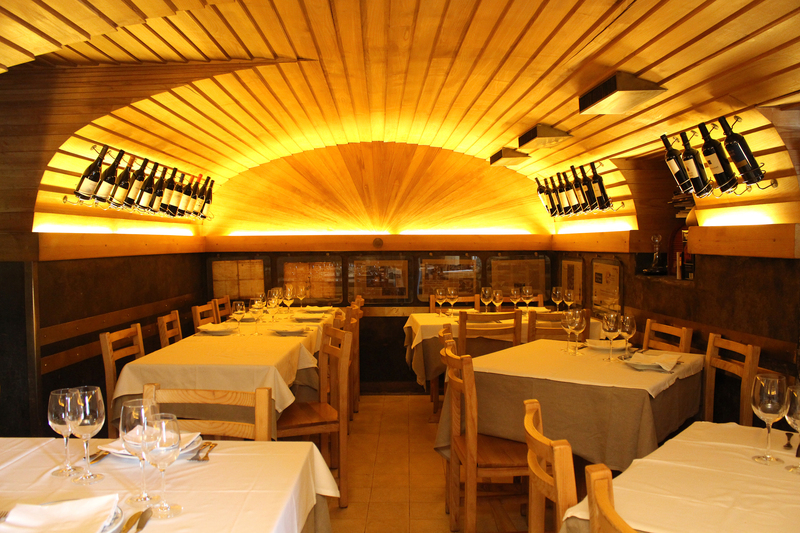 Leitaria Quinta da Paço was born in 1920, in Paços de Ferreira, as a dairy factory and still continues to respect tradition. Its whipped cream, for example, continues to be made only with whipped cream and sugar, as it happened in the 50's. 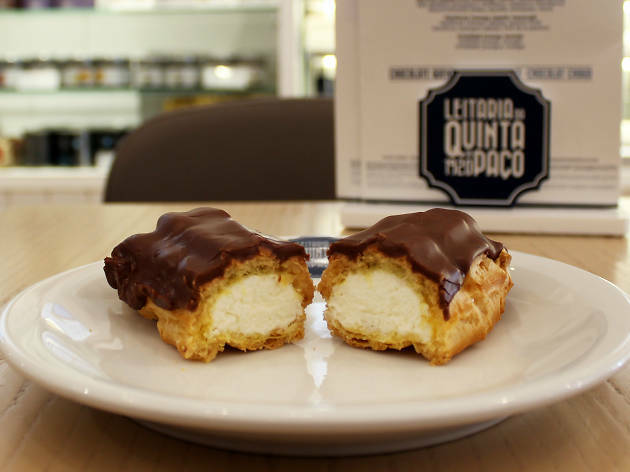 The result is a crispy éclair on the outside, because of the choux mass, and very sweet and creamy inside, thanks to said whipped cream. Don’t miss: Try the classic, our favorite, but there is more, like the lemon, the dark chocolate, the caramel and the crunchy one (between €1 and € 1.50). What is it? 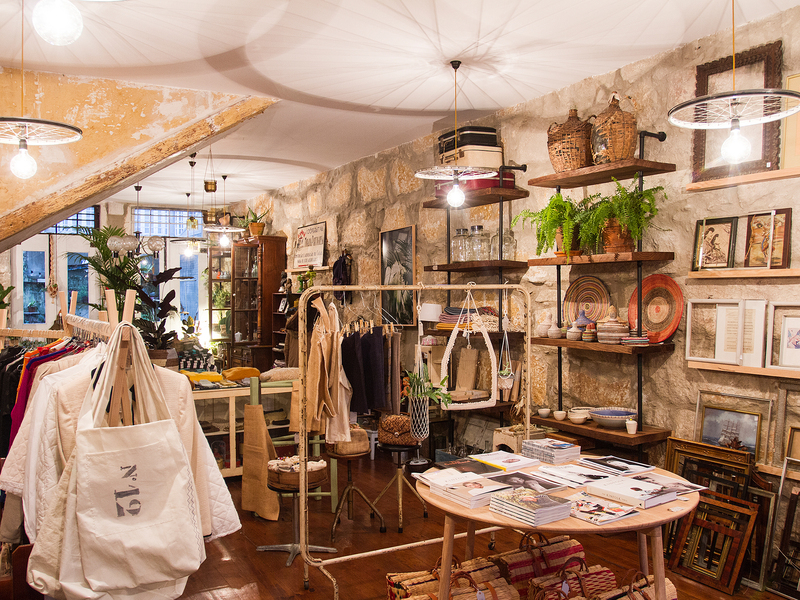 It is a store where everything that is local, handmade, vintage and sustainable gains prominence. Why go? Because you will be able to buy various things, from accessories and clothing, to decoration, to plants and furniture. The owner, Rita Dixo, does upcycling from urban garbage or damaged objects and produces pieces that are then sold in the store. There you will also find one of the most beautiful and instagrammable doors in the city. 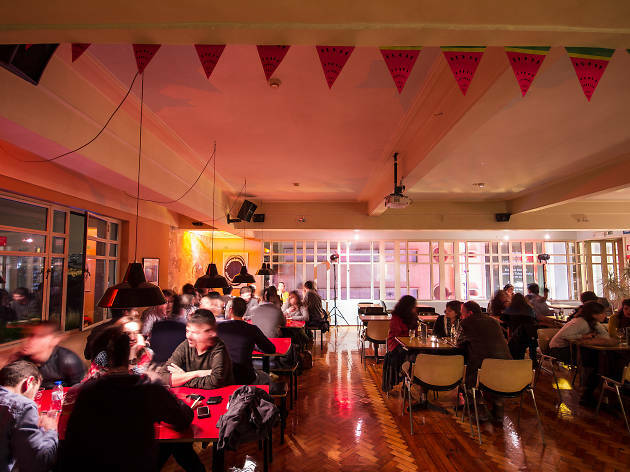 Don’t miss: Meet the Local Food Lab, with a kitchen, a terrace and a library room where on Thursdays there are themed dinners - you have to book ahead- with guests from various areas. What is it? It is one of the favorite terraces in the city for locals (and tourists) for a drink at the end of the day, which often lasts into the night. Why go? The sun is shining here for the most desired hours of the day, between 1pm and 6pm, ideal for a light lunch and an afternoon spent in good company. As far as snacks are concerned, Aduela has cheese boards and open toasts that are well worth it. A bonus? Animals are welcome, so bring your four-legged friend. Don’t miss: The good wine offer and the national preserves that are served here. There is something for everyone. From sardines in tomato sauce, to the sardine fillets in olive oil. What is it? A traditional grocery store, founded in 1917, which began as a shop dedicated to tea, coffee and spices. In the meantime, the offer was expanded and now the sausages, the Serra cheese and the candied fruit stand out. Why go? The imposing façade, in the Art Nouveau style, catches the attention of those who pass and deserves to be appreciated. But it's what’s inside that makes you want to come back. Here you will find almost everything you need, such as cookies, almonds, olive oil, many wines and sausages, all in a family atmosphere. 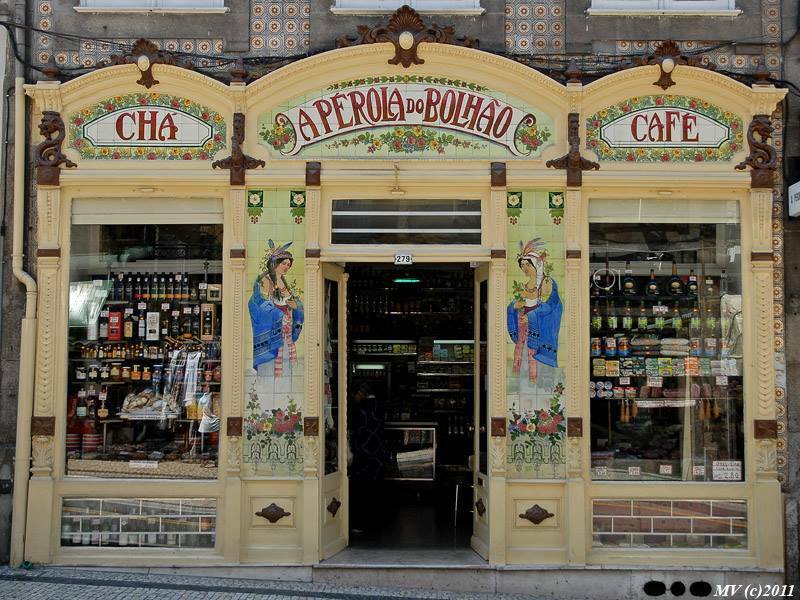 Don’t miss: Charcuterie, nuts and cod must always be considered on a trip to Pérola do Bolhão. What is it? 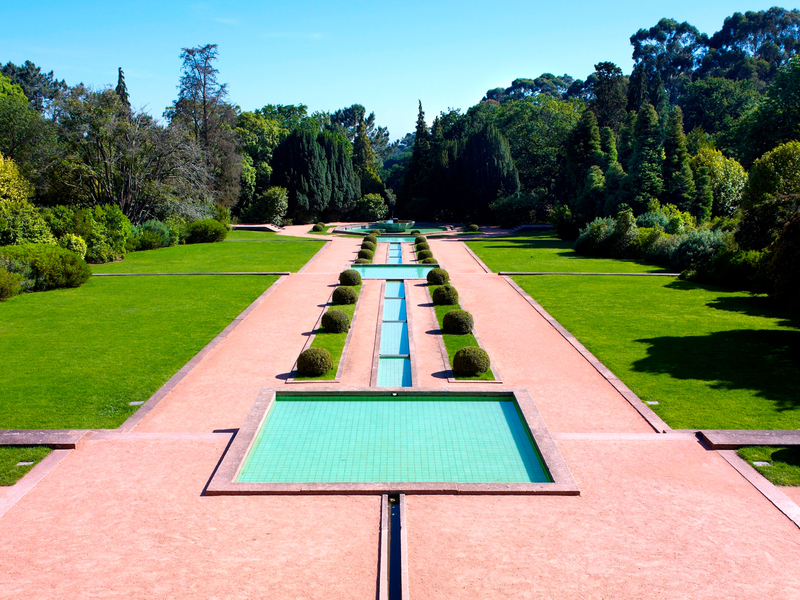 One of the most important national institutions, possessing a valuable historical and cultural heritage, composed by the Museum, designed by Álvaro Siza Vieira, by the Casa de Serralves (Serralve's House), an example of Art Deco architecture, and by the Park. Why go? The Serralves Park, with its great diversity of spaces, harmoniously interconnected, is a reference in the landscape patrimony in Portugal. During a visit, in addition to being able to contact nature and appreciate the diversity of trees and shrubs, you can visit the permanently exposed sculptures that make up the Foundation’s Collection. Don’t miss: In addition to the traveling exhibitions, there are many other permanent exhibits that makes Serralves a good idea at any time of the year. What is it? It is a reference in the current cultural outlook of the city. Together with the Carlos Alberto Theater and the Monastery of São Bento da Vitória, it serves as a stage for the main cultural events. Why go? If the shows it hosts don’t seem reason enough, you can always visit this theater for the ornate and imposing architecture that characterizes it. It was officially inaugurated on May 13, 1798, under the name of Real Theater of St. John, by King João VI. Don’t miss: Be aware of possible guided tours that take you to the showroom, the rehearsal room, dressing rooms and technical areas. What is it? It is a mandatory stop in the city. Here are the best hot dogs in Porto, which bring people of all ages and professions to their counter. Why go? Because for more than 50 years the art of cachorrinhos (small hot-dogs) has been improved in this space. Just to give you a brief overview, on a normal day are served 300 of those. The bread is thin and crispy, the sausages are of great quality, and the cheese is melted to support them. In the end, it is all brushed with butter and hot sauce (€3.40). 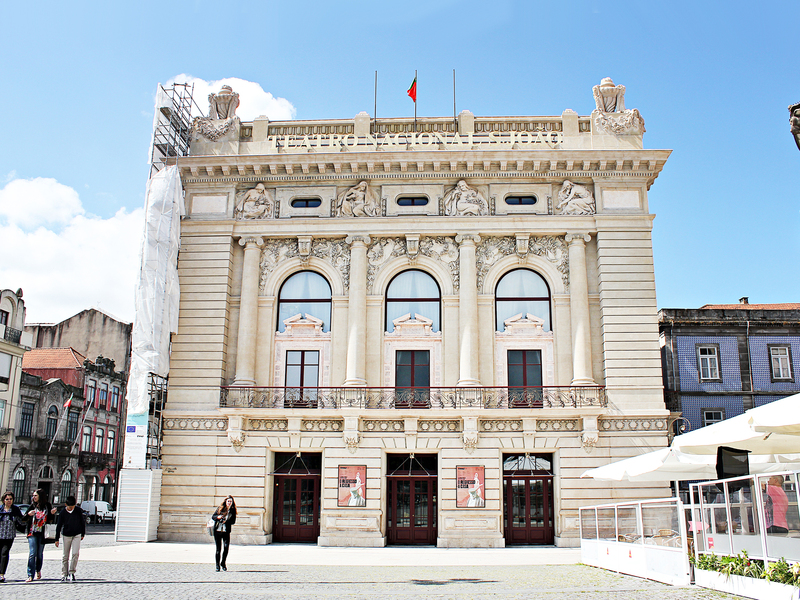 Don’t miss: Accompany your cachorrinho with one or two fine cold beers (finos) and go catch a show at the National Theater São João, which is right next door. What is it? This garden is at the rear of the Justice Palace and is developed on a series of steps. It is here that lives the largest Ginkgo Biloba in Portugal, a tree with about 35 meters. Why go? As the day begins to approach the end, locals gather in this garden, one of the most sought after in Invicta, for a good time amongst friends. Do not be surprised to see people of all ages, playing musical instruments and admiring one of the most beautiful views of the river Douro. Don’t miss: Join one or two friends, order some beer (locals call them finos) from the bars around and enjoy the beautiful sunset. The photos will be a hit on your social media. What is it? A restaurant of fine dining cuisine with very few seats, open kitchen and a menu that will change depending on the season and the customers. Why go? Because it is a real experience for the palate. And we are not afraid to tell you that this tasting, made up of ten moments menu (€80), is sure to become one of the best dining experiences of your life. Want a tip? 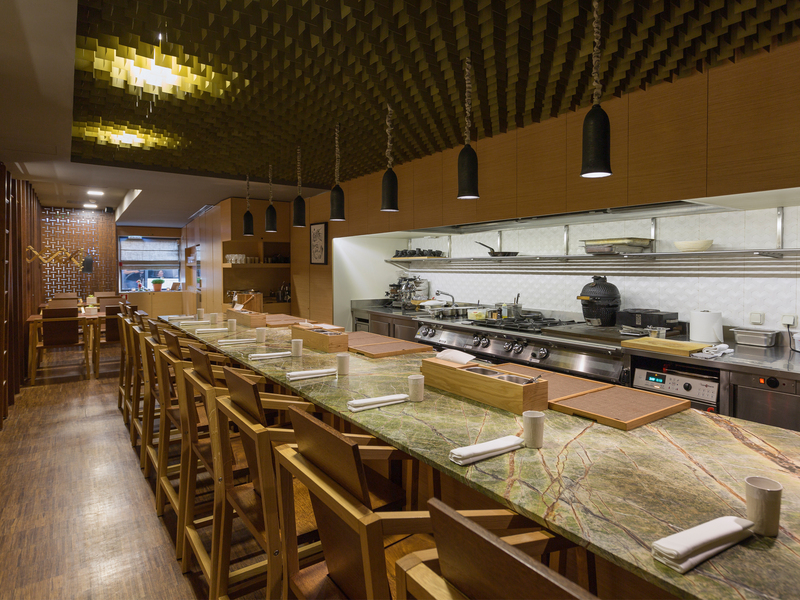 Seating at the counter is preferred because it has a privileged view of the kitchen. Don’t miss: The dishes are never the same, but we guarantee that everything is a must, so do not waste time and book your seat in this restaurant. There is a waiting list but even this will become irrelevant when you get there. What is it? 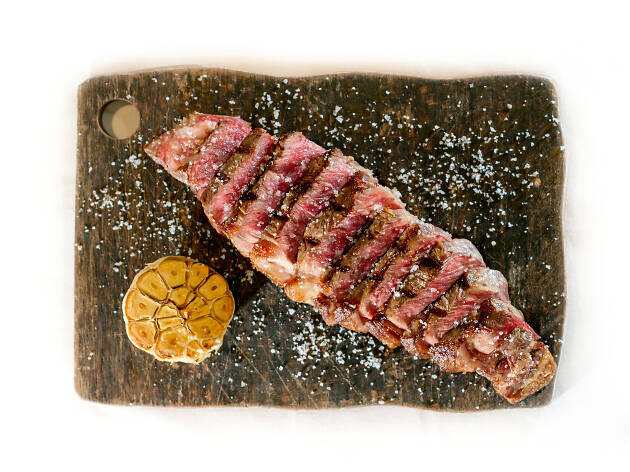 It is, nothing more, nothing less, one of the best meat restaurants in the Greater Porto region. It is in Leça da Palmeira and is the ideal spot for carnivores. Why go? First, the high quality of the meats served there. Then, for the whole surrounding scenery. Installed in a ship terminal, the whole concept revolves around this: one enters by tunnel as one does when entering a plane, there are suitcases at the entrance of the restaurant and the menu is a passport. Don’t miss: Sarrabulho potatoes (€3.50), Black Angus with smoked rice, onion rings and spinach mousse (€42/2 people) and the Decadente de Chocolate, a cake with three textures (€4.50). What is it? It is one of the most iconic venues in the city, that hosts concerts of various musical genres. It has a restaurant at the top and a cafe on the ground floor. Why go? There is always something happening at Casa da Música, which has a dynamic and innovative calendar, and benefits from resident groups such as the Symphony Orchestra, Remix Ensemble and the Baroque and Choir Orchestra. The musical spectrum you'll find here goes from classical music to avant-garde urban trends. Don’t miss: Get to know this work by the architect Rem Koolhaas. Guided tours are priced at €10 per person. The best of all? 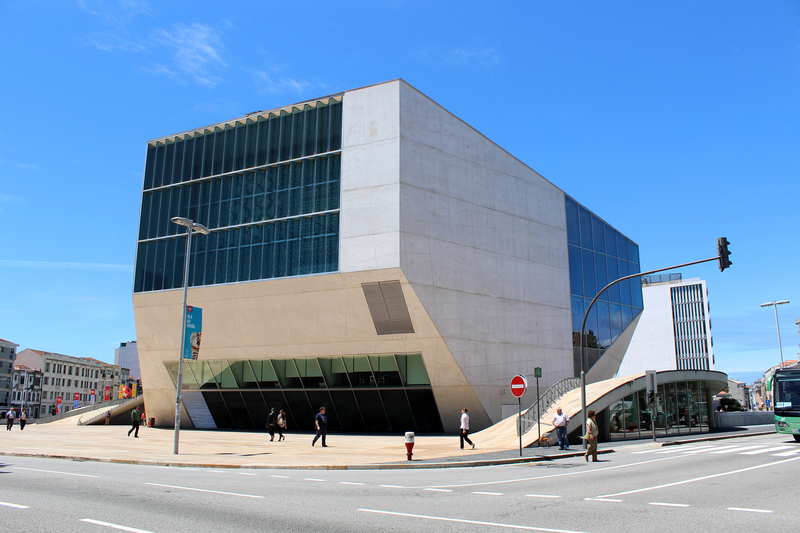 The amount reverts to the purchase of a ticket for a concert at Casa da Música. What is it? 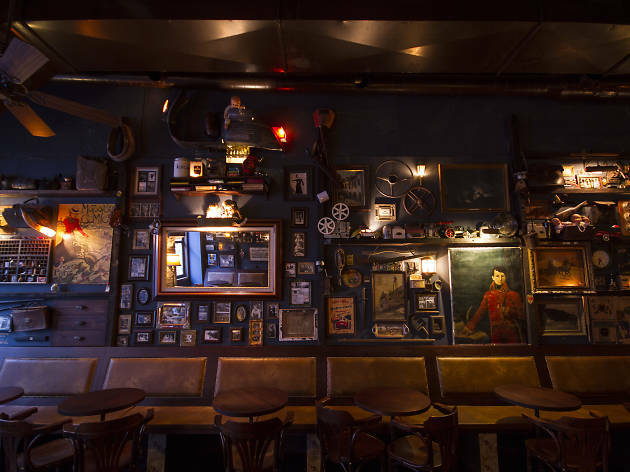 There is an older brother in Foz, but this one, opened in 2016, quickly became one of the busiest bars in Baixa. Why go? 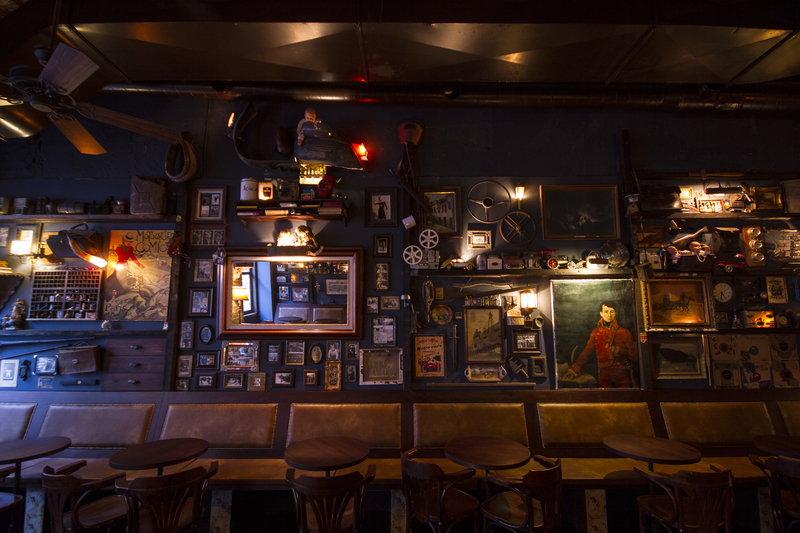 Because of the low light, the antique-furnished walls and the good drinks, elements that remind you of a British pub, make it the ideal place to gather friends to chat before or after dinner. For drinking, there are international beers, such as Erdinger (German) and Guinness (Irish), a good whiskeys menu and various cocktails. Don’t miss: Every week they serve a craft beer of different pressures. And they are a good option to watch football games while having some snacks. What is it? 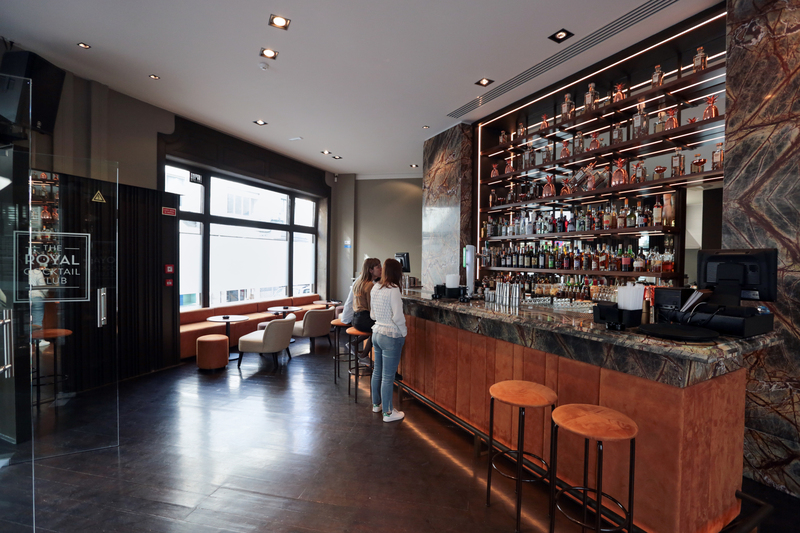 The Royal Cocktail Club is a specialty cocktail bar, housed in a 100-year-old building in Baixa. Why go? Because the stars of the house are the signature cocktails, idealized and prepared by four bartenders with plenty of experience in the field: Daniel Carvalho, Tatiana Cardoso, José Mendes and - the best known and awarded - Carlos Santiago. There are also alternatives without alcohol, the so-called mocktails. Don’t miss: On the lower level, where entrance is only allowed by reservation, there are board games that involve alcohol (of course), a good time and friends. What is it? It is one of the most eclectic spaces of Invicta, where music, art, food, drinks, cafes and parties are joined. Why go? For many reasons. This space, just in front of the Porto Coliseum, is kind of a cultural producer, with an artistic conscience, always with doors open to the city. 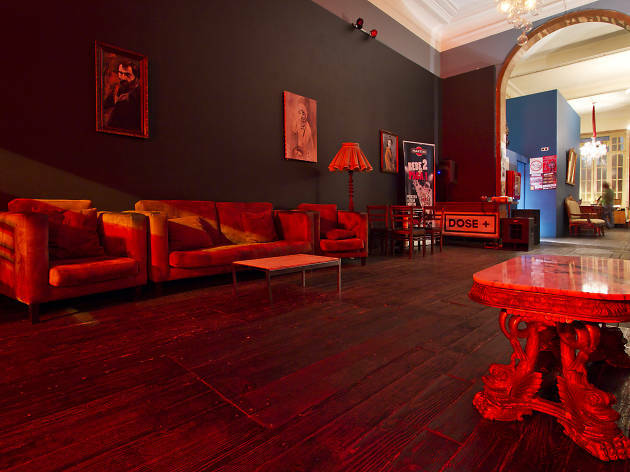 Since January 2011 it hosts concerts, plays, exhibitions, artistic residences, drinks at the end of the day and parties all night long. 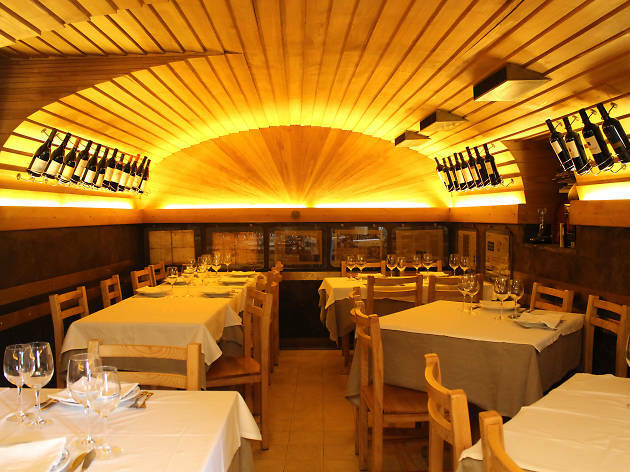 Don’t miss: Go to Vícios de Mesa, the Maus Hábitos restaurant, with many vegetarian options: from the wood-fired pizzas to the falafel, to the salads and lasagne. What is it? It is a mandatory place to visit during a night out. It is in the Paris Galleries (Galerias Paris) and has a busy concert schedule worth paying attention to. Why go? 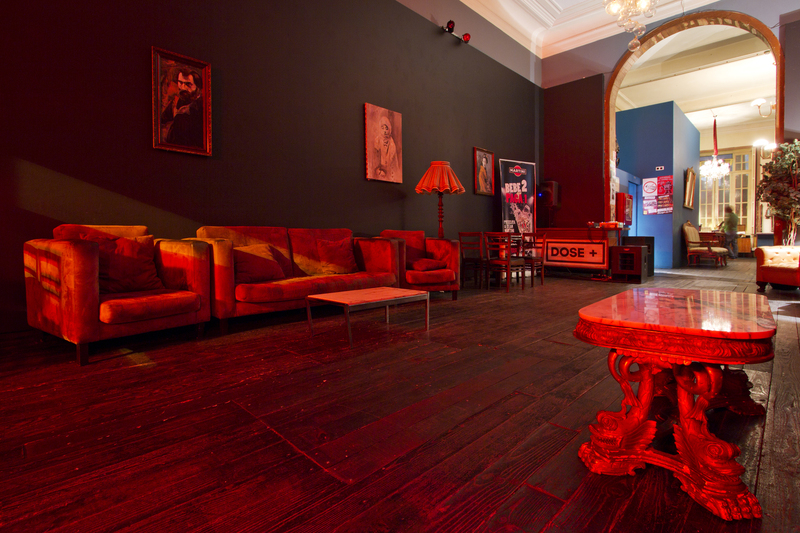 Firstly because on the top floor there is a bar with large sofas and armchairs that invite you to have a drink amongst friends. And then, because on the lower floor, which is accessed through a grand staircase, that has two dance floors with different music styles to dance to. Don’t miss: Theme parties that happen here regularly, the heterogeneous public and evenings that last until six in the morning. 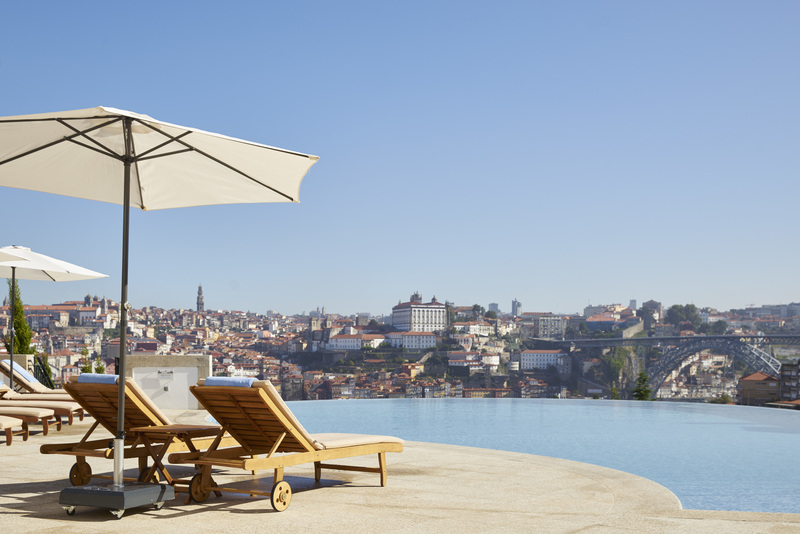 Regardless of whether you're in Porto for a weekend away or a long, leisurely vacation, there's no reason why you shouldn't stay in style. The city is absolutely brimming with gorgeous, historic and designer hotels. Are you craving a bit of pampering? There's a spa hotel out there that'll hit the spot. Want to be waited on hand and foot? No problem. Prefer some personality in the decor as opposed to stark minimalism? You got it! 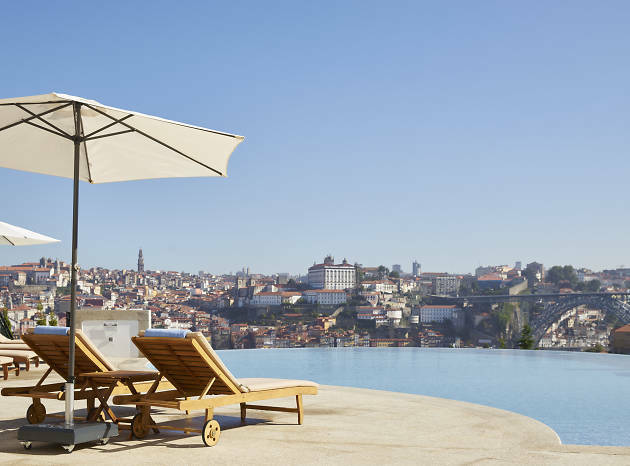 We've snooped around the accommodation the city has to offer and have come up with a definitive selection of what we consider to be the best hotels in Porto. All you have to do is book one. Don’t walk around looking down at the ground, or up to the sky – look at the walls around you. 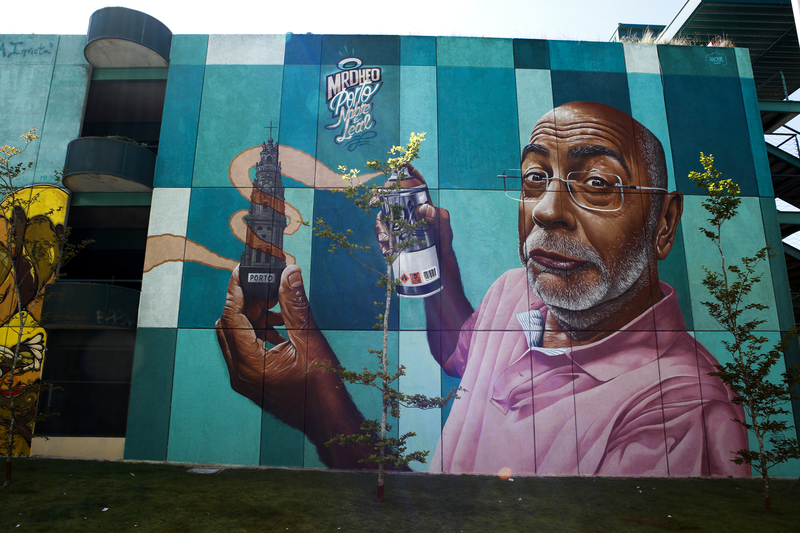 In Porto, art is everywhere.